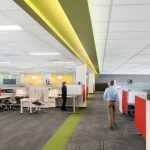 Howell Construction, in collaboration with RNL Design (now Stantec), completed a 350,000 square-foot tenant improvement at DigitalGlobe’s new corporate headquarters located in Westminster, CO. 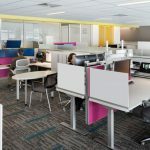 The first phase of work included electronics lab spaces, a new main data facility and a new fiber optic network structure to ten renovated IDF locations. 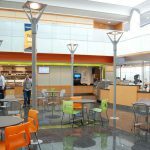 Other scope of work included the creation of a new lobby entry with unclassified visitor conference rooms, restrooms, security center, expanded food service facility, gyms and locker rooms. At the beginning of the design process, our team spearheaded a thorough retro-commissioning study to evaluate the energy performance of the existing building. 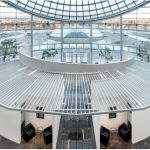 We found serious controls and systems maintenance issues that caused the building to consume energy at three times the rate of a standard office building. Howell led the effort to correct these issues and brought energy efficiency to code compliant levels. As design neared completion, our team was tasked to substantially reduce the project costs to fit our client’s revised budget. In order to complete this task, our team worked with key subcontractors to develop a solution to provide mission critical resources utilizing existing and relocated equipment in lieu of purchasing new equipment, thus reducing the project budget by approximately $4,000,000 and hitting DigitalGlobe’s target. "It’s really a team environment. Once you get involved with Howell, you’ll want to stick with them."